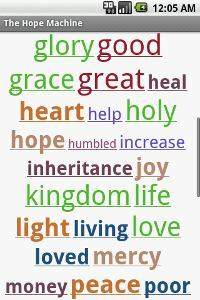 The Hope Machine is a Bible reader with a tag cloud UI and full text search. It also lets you email verses to a friend. Driven by what's going on in your life, it helps you find relevant parts of the New Testament. It uses the KJV New Testament.